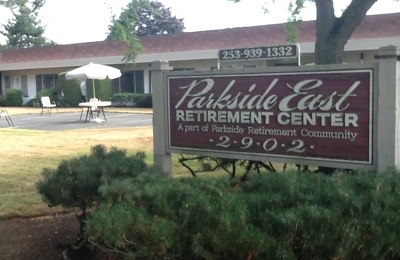 Parkside Retirement Community first opened in 1972 and was expanded to include the Independent Living building, Parkside West, in 1993. Conveniently located 10 minutes from SR-167, and SeaTac airport as well, we know you'll enjoy the beautiful grounds and breathtaking views of Mt. Rainier. Jennifer Jacobson is our administrator and you'll sleep well knowing she's only the third administrator since 1972 at Parkside? And the previous two still work with us! We always offer a wide range of activities and services to better accommodate you and your loved ones. At Parkside Retirement Community, you'll be able to choose from a number of floor plans and decide which will best suit your needs? All of which are roomy and spacious. 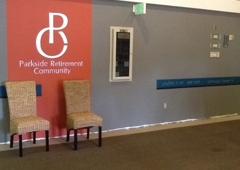 Come stop by for a tour today and see why we are hands-down the best in the industry!Parkside Retirement Community has been locally owned and operated since 1972. From day one our top priority has always been to provide the best possible care at the most reasonable price. Because we are a much smaller operation than our competition, we are able to cut out the unnecessary costs and overhead that is common in this industry. Best of all, we choose to pass this savings on to our residents and their families? So you are free to live the life you've envisioned for yourself and aren't saddled with monstrous financial requirements each month.For our residents, dining is an important part of the day, and we treat it as such. Upon moving into one of our communities you will receive a visit from our Foodservice Director to inquire about likes, dislikes, and special needs. We adapt to you because we know you can't paint everyone with the same brush?. Our kitchen and dining room staffs are among the best. We serve delicious, healthy meals with a variety of options. Our menus feature a diverse and exciting array of choices, with fresh fruits and vegetables offered each day. In our Independent buildings, we serve one meal per day. For our Assisted Care we serve three meals per day. If you have any questions, concerns, or comments about our dining services please feel free to contact the specific community involved and we will help you promptly.At Parkside Retirement we offer a wide range of activities as well as other conveniences to you. Our activities never stop? So you'll never get bored! Whether it's an outing to a restaurant or Snoqualmie Falls, or staying in for coffee hour to socialize with other residents, we're sure you'll find something you enjoy. There are monthly birthday celebrations, special events for every major holiday, and exercise classes to keep you in top shape. To make life even easier, we also offer rides to doctor appointments, pharmacies, grocery stores, and shopping malls on a frequent basis. In a nutshell, we're here to make things flow smoothly for you.